During the summer before the 2009 football season, I went through the CranioSacral Intensive Program at The Upledger Institute looking to deal with some nagging physical complaints I had from past injuries. I ended up getting the relief I was looking for and much more. I credit much of my well-being and my 1000 yard season to the multi-modality manual therapy program I experienced at Upledger. The Dr. John E. Upledger Foundation and the Ricky Williams Foundation in conjunction with the Upledger Institute Clinic in Palm Beach Gardens, FL have successfully facilitated manual therapy treatment programs for 11 former professional football players from the NFL and Canadian Football league suffering from concussions and post-concussion syndrome. The treatment program utilizes CranioSacral Therapy, Visceral Manipulation, Neural Manipulation and other healing modalities aimed at helping the body heal itself. CranioSacral Therapy and Visceral Manipulation: A New Treatment Intervention for Concussion Recovery published in Medical Acupuncture in November 2017, is a case series that describes the effects CranioSacral Therapy (CST), Visceral Manipulation (VM), and Neural Manipulation (NM) modalities for have demonstrated for treating patients who have post-concussion syndrome. Within our seven-day therapy program, pre and post testing is completed in an effort to collect data, along with four hours of manual therapy daily for five days. Group discussions are held for support and camaraderie daily. Several of the former NFL players are now warriors in the awareness campaign about the debilitating long term effects of Traumatic Brain Injuries and multiple concussions. We will continue to partner with them to spread the word about how manual therapies including CST, NM, and VM are critical missing pieces in existing concussion treatment protocol for people of all ages. The Ricky Williams Foundation teamed up with the Upledger Institute Clinic in 2014 using Upledger CranioSacral Therapy, Barral Neural Manipulation and Barral Visceral Manipulation for a five-day intensive manual therapy concussion program preliminary pilot research project. Ricky Williams, who played professional football for 12 seasons and, like all players, suffered repeated trauma to his head and body during his career, strongly supports this pilot program. In describing one of his best seasons as a player, Williams said, "During the summer before the 2009 football season, I went through the CranioSacral Intensive Program at The Upledger Institute looking to deal with some nagging physical complaints I had from past injuries. I ended up getting the relief I was looking for and much more. I credit much of my well-being and my 1000 yard season to the multi-modality manual therapy program I experienced at Upledger." The intensive program was designed for football players with a predisposition to Chronic Traumatic Encephalopathy (CTE) and objective to demonstrate that advanced therapies administered by certified, licensed, manual therapist, would help to alleviate the symptoms of post-concussion syndrome. The results from this study are far reaching – not only can these manual therapies help people with sustained repeated trauma, such as with professional football players, but also those who have been in many types of accidents. 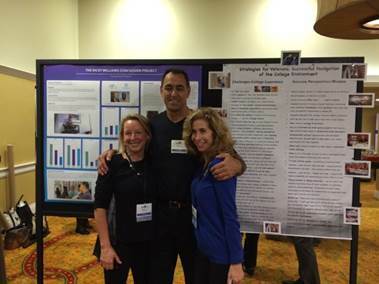 Sally, Melinda and George did a Poster Presentation showing the results from The Ricky Williams Concussion Project that was conducted at the Upledger Institute. The Poster Results were prepared by Gail Wetzler, PT, DPT, EDO, BI-D. The 4th Santa Clara Valley Brain Injury Conference was held February 5-7, 2015 Santa Clara, California. In attendance was an audience of around 500 rehabilitation professionals representing a variety of disciplines as well as individuals with brain injury, family members, and caregivers. Sally, George, and Melinda setting up the Poster Presentation. 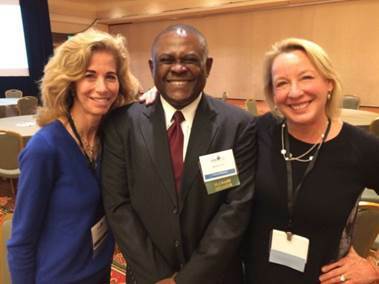 Melinda, Forensic Pathologist Bennet Omalu, MD., and Sally. Dr. Omalu coined the term Chronic Traumatic Encephalopathy (CTE). This is a kit that we put together to help you spread the word about CranioSacral Therapy, Visceral Manipulation, and Neural Manipulation for helping people with Post-Concussion Syndrome and other brain injuries. * Asterisk items are available for purchase. All others are free downloads. These are resources for Concussions and our Integrative Modalities.